هدف پژوهش حاضر، مطالعه نقش رسانه‌ ملی در شکل‌دهی به الگوی صحیح مصرف شهروندان در مسائل شهری و در نهایت اتخاذ یک مدل نظری در این زمینه بوده است. بنابراین با توجه به رابطه متقابل رسانه ملی، مصرف و مسائل شهری، سازوکارهای تأثیرگذار بر مسائل شهری شامل ارتقای کیفیت زندگی شهری، محقق‌سازی شهر الکترونیک به عنوان زیرساخت اصلی دولت الکترونیک و ارتقای سرمایه اجتماعی شهروندان، مطرح شد و سپس بر چارچوب مفهومی شهروندی فرهنگی برای توسعه پایدار در مسائل شهری تأکید صورت گرفت. در بخش دیگر مقاله به رابطه متقابل رسانه، الگوی مصرف و مسائل شهری پرداخته و در نهایت الگویی جامع برای تبیین نقش رسانه ملی در شکل‌دهی به الگوی صحیح مصرف شهروندان در مسائل شهری ارائه شد. بر اساس این مدل، رسانه ملی از طریق بهبود سازوکارهای تأثیرگذار بر کالبد شهری و همچنین بازنمایی نظام‌مند مسائل مختلف و انتقال معانی مورد نظر با استفاده از دستاوردهای نظریه‌های برجسته‌سازی، چارچوب‌بندی و کاشت، دستیابی به الگوی بهینه مصرف را تحقق می‌بخشد. The present article aims to study the role of National Media in shaping citizens' proper pattern of consumption and to offer a theoretical model for it. Given the interfaces between National Media, consumption and urban concerns, the article introduces mechanisms affecting urban issues (including improving urban life quality, realization of an electronic city) as the Electronic Government's main foundation and source of boosting citizens' social capital. The article focuses on the conceptual framework of cultural citizenship for sustainable development in urban issues. It further explores the relationship between media, consumption pattern and urban issues and finally offers an inclusive pattern for explaining the role of National Media in shaping citizens' proper consumption pattern. Based on this model, National Media can realize an optimized consumption pattern through improving mechanisms affecting urban structure, systematic representing of different issues, and conveying intended meanings using theories of highlighting, framing and cultivation. اباذری، یوسف. (1377). خرد جامعه‌شناسی. تهران: طرح نو. ایمانی جاجرمی، حسین. (1380). سرمایه اجتماعی و مدیریت شهری. 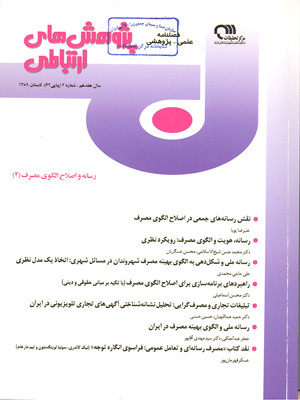 فصلنامهمدیریتشهری، 2 (7). باکاک، رابرت. (1381). مصرف (ترجمه خسرو صبری). تهران: شیرازه. بوردیو، پیر. (1384). شکل‌های سرمایه، در سرمایه اجتماعی: اعتماد، دموکراسی و توسعه (ترجمه افشین خاکباز و حسن پویان). تهران: شیرازه. تلالی یام و فاراندز، ک. (1382). تکنولوژی، فرهنگ و رقابت‏پذیری (ترجمه ناصر موفقیان). تهران: مؤسسه توسعه دانش و پژوهش ایران. رهنمایی، محمدتقی. (1383). فرایند برنامه‌ریزی شهری ایران. تهران: سمت. ساروخانی، باقر. (1383). روش‌های تحقیق در علوم اجتماعی. ج 1، تهران: پژوهشگاه علوم انسانی و مطالعات فرهنگی. سورین، ورنر؛ تانکارد، جیمز. (1384). نظریه‌های ارتباطات (ترجمه علیرضا دهقان). تهران: انتشارات دانشگاه تهران. فاضلی، نعمت‌الله. (1385). شهروندی فرهنگی و فرهنگی شدن شهروندی، همایش انسان‌شناسی فرهنگی و اخلاق شهروندی، تهران: 13 و 14 دی. Coke, M.M. & Twaite, J.A. (1995). The Black Elderly: Satisfaction and Quality of Later life. New York: Haworth. Craft, S. & Wanta, W. (2005). U.S. Public Concerns in the Aftermath of 9-11: A Test of Second-Level Agenda-Setting, International Journal of Public Opinion Research, Vol. 16(4), pp. 456-462. Dahlgren, P. (2006). Doing Citizenship: The Cultural Origins of Civic Agency in the Public Sphere, European Journal of Cultural Studies, Vol. 9, P. 267. Ellison, C. (1983). Spiritual Well ـ Being: Conceptualization and Measurement. Journal of Psychology and Theology, Vol. 11, PP. 330 ـ 340. Friedman, J. (2004). Consumption and Identity, London: Routledge. Gillespie, M. (2000). Transnational Communications and Diaspora Communities, in S. Cattle (ed.) Ethnic Minorities and the Media. Buckingham: Open University Press. Hermes, J. (1997). Gender and Media Studies: No Woman, no Cry, in J. Corner, P. Schelisinger and R. Silverstone (eds.) International Media Research. London: Routledge. Hermes, J. (1998). Cultural Citizenship. in K. Brants, J. Hermes and L. van Zoonen (eds.). The Media in Question: Popular Cultures and Public Interests. London: Sage. Jayne, M. (2006). Cities and Consumption, Routledge Critical Introductions to Urbanism and the City, Taylor & Francis Routledge. King, L.A., & Napa, C.K. (1998). What Makes a Life Good? American Psychologist, Vol. 75, PP. 156 ـ 165. Kwan, V.S. Y.; Bond, M.H., & Singelis, T.S. (1997). Pan Cultural Explanations for Life Satisfaction: Adding Relationship Harmony to Self esteem. Journal of Personality and Social Psychology, Vol. 73, PP. 1038 ـ 1051. Martin ـ Barbero, J. (1993). Communication, Culture and Hegemony: From the Media to Mediations. London: Sage. McCullagh, C. (2003). Media Power: A Sociological Introduction, Pal grave. Miller, T. (2001). Cultural Citizenship, Television New Media, Vol. 2, P. 183. Pawley, L. (2008). Cultural Citizenship, Sociology Compass. Blackwell Publishing Ltd.
Schlesinger, P. (1991). Media, State and Nation: Political Violence and Collective Identities. London: Sage. Tester, K. (1995). Moral solidarity and the technological reproduction of images. Media, Culture and Society, Vol. 17, PP. 469 ـ 82. Thompson, J. B. (1995). The Media and Modernity: A Social Theory of the Media. Cambridge: Polity Press. Urry, J. (2000). Global Flows and Global Citizenship, in E.F. I sin (ed.) Democracy, Citizenship and the Global City. London: Routledge. Utsey, S.O., Bolden, M.A., Brown, C.F., & Chae, M. (2000). Assessing Quality of Life in the Context of Culture. In L. Suzuki, J. Ponterotto, & P. Meller (Eds. ), Handbook of multicultural assessment (2nd ed., pp. 191 ـ 212). New York: Josey ـ Bass.